One of my favourite gifts I’ve received this year is an annual Donna Hay magazine subscription. Like many, I admire her way with food styling, oh-so simple and elegant! Her polenta crusted potatoes is my go-to baked potato recipe. It is surefire way to guarantee soft and fluffy potatoes with crunchy exterior. In the current spring issue, I knew I wanted to try the broccoli pesto pasta recipe from the moment I saw it. 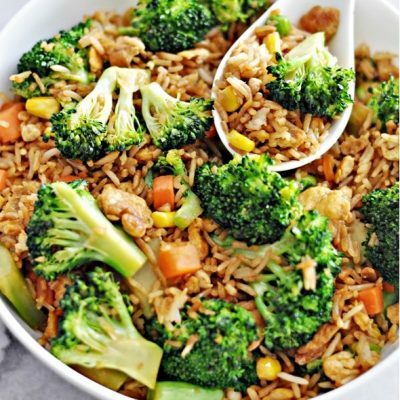 It is simple and healthy, as well as an unusual approach to eating a broccoli. My friend got me into eating a lot of raw vegetables, mainly because he has a flourishing vegetable garden. Who would have known that raw home grown sugar snap peas can be so tasty? I love munching on raw fennel too! 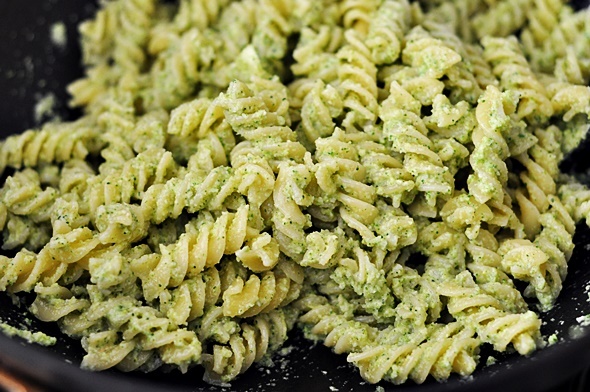 This broccoli pesto is ideal for those who enjoy raw vegetables, which may not be for everyone. Alternatively, you can blanch the broccoli florets for a few seconds before adding them into your food processor. Enjoy! 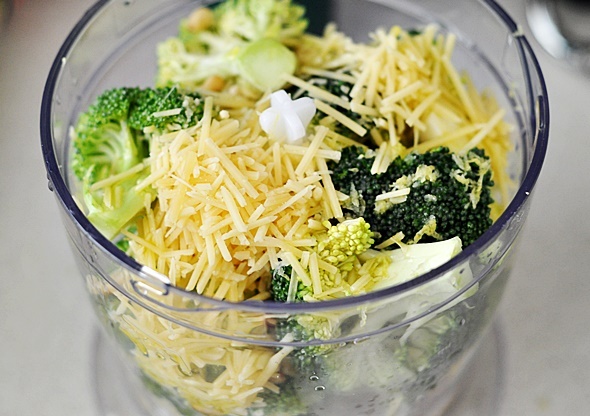 Add the broccoli, 1/2 cup of the pine nuts, garlic, lemon rind and juice, oil, Parmesan, salt and pepper in a food processor and process until roughly chopped. Set aside. 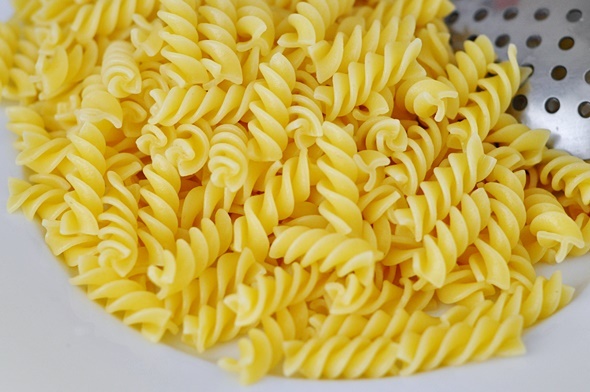 Cook the pasta in a large pot in salted boiling water according to the packet instructions or until al dente. Drain and reserve 1/4 cup of the cooking liquid. Return the cooking liquid to the pot over medium heat. Add the broccoli pesto and stir for 1 to 2 minutes or until well combined. In the meantime, in a separate pan, make 4 sunny side up eggs if you like. Divide the pasta between plates and top with the reserve (roughly crushed) pine nuts, extra Parmesan and basil leaves. 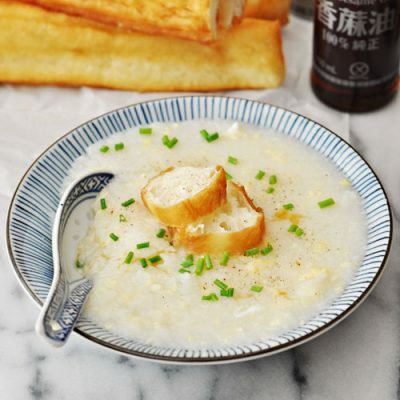 Top with egg, drizzle with the extra virgin olive oil and serve immediately. Dealing with a meal conundrum? 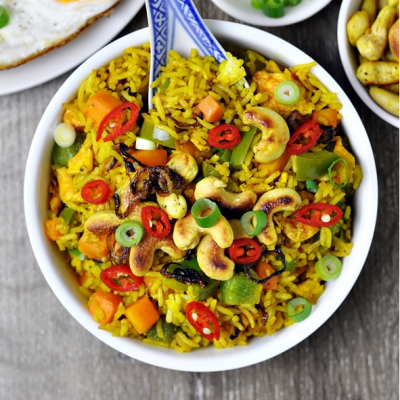 Subscribe to Fuss Free Cooking for a quick fix. Yum! Broccoli is one of my favourite vegetables so I must try this. Thanks for sharing, Emily. You are welcome Tara! I hope you will like it. 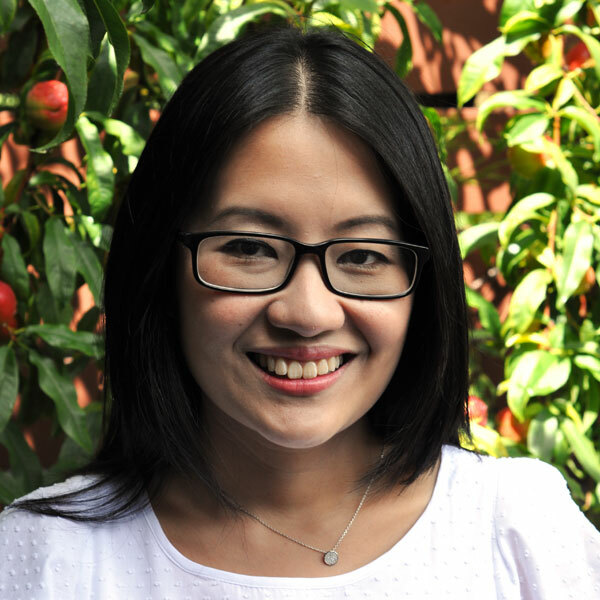 Because it is just me and my partner, a mini food chopper and a Russel Hobbs food processor & stick blender set (https://admin.bigw.com.au/home-garden/small-appliances/blenders-mixers-food-processors/bpnBIGW_0000000284404/russell-hobbs-650w-stick-mixer-rhsm650) is enough for me. The reason I need a slightly bigger one is when I make short crust pastry and a chunkier pesto like the one above. 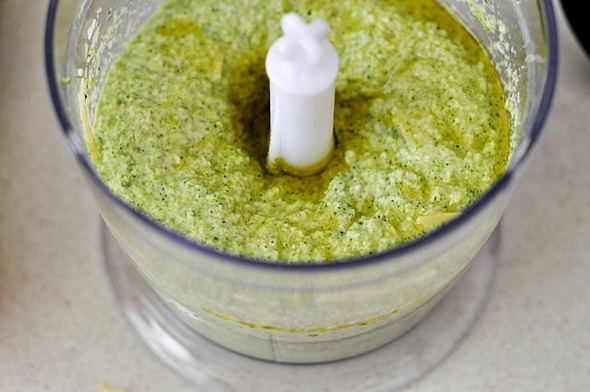 A mini chopper is great for herb pesto, blitzing onion, ginger & garlic paste. Now, the downside of having a cheaper food processor is the motor and the blade. Like when I made the broccoli pesto, there was still a floret or two that still remained chunky. Considering, how much I paid for these appliances, I am happy to put up with it. I am considering of investing in a more expensive one like Breville Kitchen Whiz Pro, but part of me still unsure whether I would use it enough to justify such a large purchase. At the end of the day, it depends how often you are going to use it and how much you will need it in your cooking. Side note: When you buy a cheaper food processor make sure you really use it before the warranty expired. Maybe I was unlucky but I bought a medium sized $40 food processor with a chute and I have only used it twice before it died on me :S When I bought the Russel Hobbs one and it would not start when I used for the first time, which I have got it exchanged. I may have scared you off by buying one now lol. With that being said, I also had great experience with mini chopper and my Kambarook chopper and stick blender set which I could not find anymore. delicious! 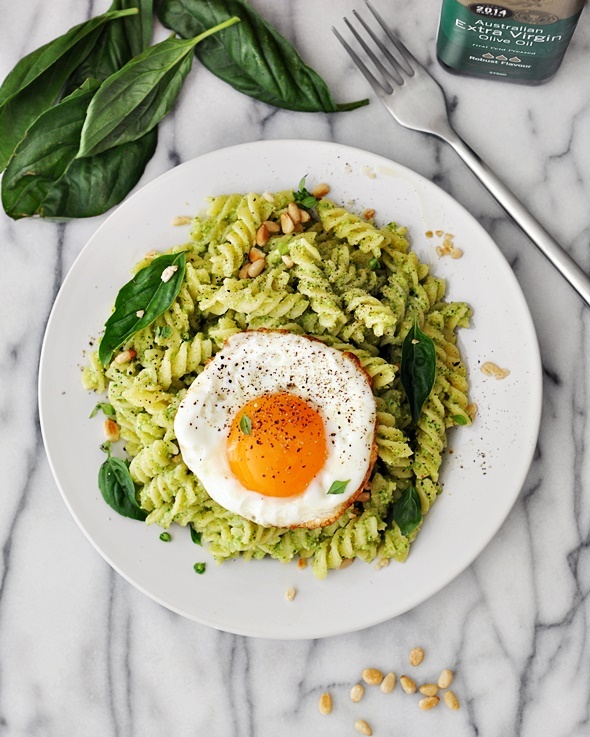 I’m not a huge fan of basil and regular pesto, but this sounds great! It is worth trying if you don’t mind raw broccoli. I find it is a more palatable way of eating raw broc instead of on its own. I love broccoli! I’ve made a sort of broccoli pesto before but far from traditional (not like broccoli in pesto is traditional to begin with) as it had yoghurt and things added to it. 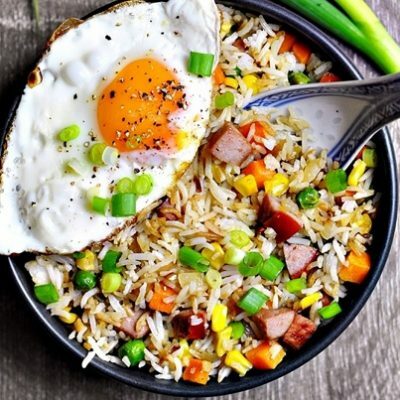 This version looks just lovely tossed with hot pasta, and that egg is gorgeous! Also, thanks for linking to your polenta crusted potatoes, they look so good. Have pinned and pinned and will be making both of these recipes very soon! I hope you will like both recipes Katie! Never thought of adding yoghurt to broc pesto before, that’s creative! I hope you have shared it on your blog coz I would love to check it out. Broccoli pesto! What a brilliant idea. Wonder if I can get my kids to eat this….they’re so picky with vegetables. Because there are kids involved, I’d suggest that you add some fragrant basil to mask the raw broccoli scent. I don’t have kids myself but I have this suspicion kids can spot vegetables a mile away lol. What a healthy meal. And it’s quick to prepare! Thanks. This looks amazing! 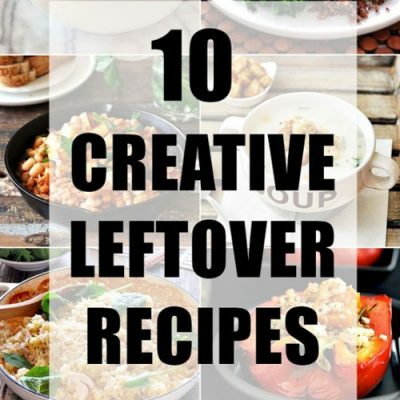 Was wondering if this is something I could make and freeze? (Just the Pesto Portion). I live on my own and I work 6 days a week – usually I meal prep on Mondays (my one day off) so that dinner is quick the rest of the week. What do you think?